We love hearing from you! Submit your story at the bottom of this page. 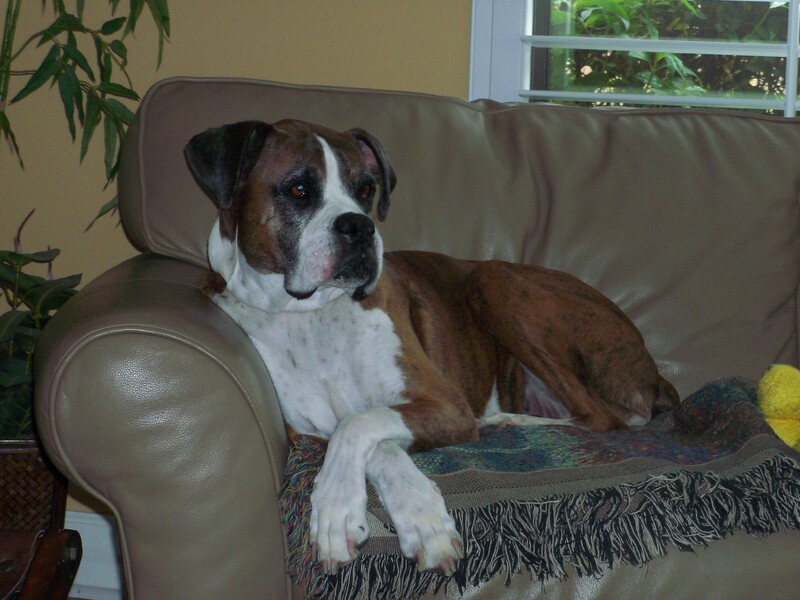 My Wife Kay Ellen and I lost our beautiful boxer girl SUGAR in March of 2014. We are both getting older, I am 80 this year. 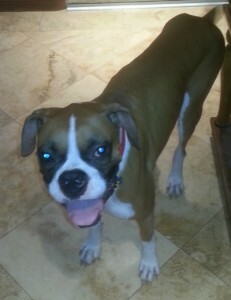 We wanted another boxer but were not sure that we were up to handling a large active dog. We decided that a Senior dog would be the perfect solution and contacted Boxer Rescue through the website. We were looking at all the handsome pictures when we saw ” Truman” looking back at us with those kind brown eyes. His owner had died and he had no one to give him a forever home. Trumen has so much love in his heart for everyone and has brought new joy to our lives. He has a laid back personality which fits perfectly with ours. Beloved senior dogs make wonderful companions and we are so glad that we have given Truman his forever home. Breezy is my first boxer even though many think she’s a mix. I don’t care as she’s a great dog, super smart and I love her with all my heart. I had rotties in the past and they were both also great awesome dogs. I am very thankful that Breezy came into my life. Our Jeanie has been such a wonderful addition to our home. Jeanie was my foster girl who instantly took to my Autisic son. She adopted him as her own and sleeps with him every night. She aits for him to come home and even begins sitting by his bedroom door 30 minutes before bedtime. She came to us via Lindsey who found her dumped on Craigslist after spending all of her 7 years with her family. Apparently, they no longer wanted dog hair in their home. She is just perfect and has the best “Boxer Wiggle” I’ve ever seen. Thank you Florida Boxer Rescue for making us a foster failure. Jeanie is on the right in the photo and that’s Grover on the left. She’s a wonderful addition to our home!! Bronx is a very special boy that has had a hard way so far in his 1 1/2 years. Both of his back legs had ACL repair work done on them but that doesn’t stop him from being a great addition to my family. He has a 4 yr old boxer named Roxy that keeps him going all day long running in the yard digging holes(not allowed) sun tanning and just being dogs… I have just lost my 10 yr old Dice which was heartbreaking and Bronx came along and started giving me those boxer slops(kisses) and that was healing me. Bronx is a very special boy and I am glad he came into my life. I am sure we are healing each other and I love him very much. Life would not be the same without him. He is napping on the couch right now I think I will join him . 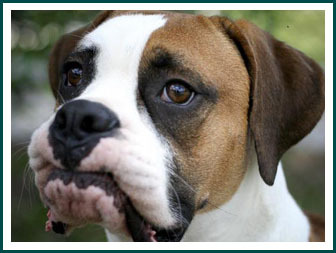 . . Boxers are such a wonderful breed – I wish I could have more. They say THANK YOU everyday. 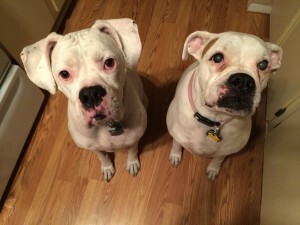 About 8 years ago we adopted our beautiful white boxer Queen, she was our first boxer ever. She was the best dog! Unfortunately we had to put her to sleep Feb 2014 due to her having degenerative myelopathy. We will never be able to replace her but have come very close with our newest adoption from FBR (the year before Queen passed we adopted our second boxer from a family that was going to have him put down for no reason). Bodee (was Joey Jo) is a great addition to our family. He has fit right in since day one. These two boys are each others best friends and they love to play, play and play some more. Thank you so much to Lindsey for understanding what we were looking for and matching us up with Bodee. WE LOVE HIM and I think he’s pretty fond of us too. 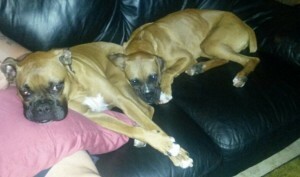 In the picture our 4 year old boxer is in the front and Bodee is in the back.